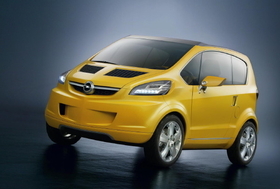 Opel has mulled adding a minicar since it unveiled the 3-seat Trixx concept at the 2003 Frankfurt show. MUNICH -- Opel would launch a rival to the Ford Ka if Magna International Inc. wins control of the carmaker, General Motors Europe President Carl-Peter Forster says. The “New” Opel could even sell an electric variant of the car, Foster told a German newspaper. Forster added that a rival to the Renault Logan also is a possibility. Opel has wanted to enter Europe's fast-growing minicar segment since it showed the Trixx concept at the 2003 Frankfurt auto show, but its U.S. parent's financial troubles have held back its ambitions. GM's entry in the minicar segment in Europe is the Korean-built Matiz, which is sold under the Chevrolet badge. "We could start production of a minicar in 2012,” Forster told the Frankfurter Allgemeine Zeitung in an interview. Forster said Magna has set aside 250 million euros for the car's development. He said Magna could develop an electric powertrain for the model. Previously, Opel's management has sought to develop a model below the Corsa subcompact from GM's new global architecture for minicars, which underpins the latest Matiz. But if the German-based unit separates from GM, it could develop a minicar based on the Corsa architecture. Forster told the Frankfurter Allgemeine Zeitung that Opel's engineers could also develop a low-cost family car similar to Renault's Logan. The car would be made in cooperation with Russia's No. 2 automaker, GAZ Group and would retail at about 8,000 euros. The Logan has been a success in emerging markets such as Russia because it offers buyers a compact sedan with Western technology at an affordable price. Magna and Belgian investment group RHJ International SA have made rival bids to buy a majority stake in Opel and its British sister brand Vauxhall. GM's board is expected to consider the bids on September 8-9.